If you are looking for a truly unique design, look no further than Ikat Chevron. 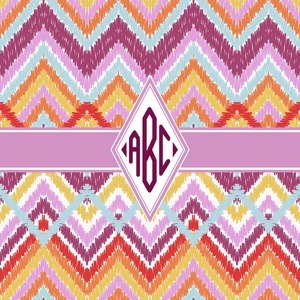 This design combines chevron stripes and Ikat patterns. Unlike typical Chevron stripes, these stripes do overlap in parts of the design. The design includes two shades of purple (light violet and plum), light blue, orange,dark yellow and white. 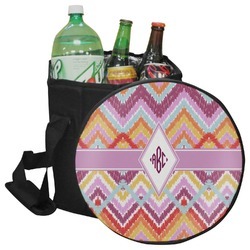 You can personalize this design by changing the text in the label to your monogram or initial or changing the label itself to another shape or color.